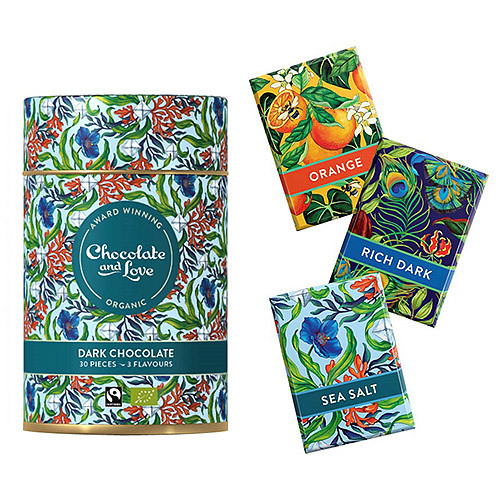 30 individually wrapped chocolate pieces, beautifully packaged in a high quality, hand painted design tin. Perfect as a gift for a loved one or just for yourself! 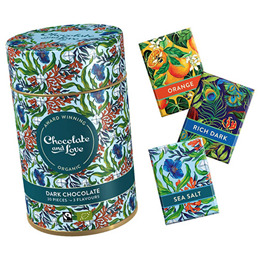 Cocoa mass*, cane sugar*, cocoa butter*, whole cane sugar*, vanilla pods*. *Certified organic. Cocoa, sugar, vanilla: traded in compliance with Fairtrade Standards, total 100%. Cocoa: 71% minimum. Below are reviews of Chocolate and Love Dark Tin - 30 x 5.5g Pieces by bodykind customers. If you have tried this product we'd love to hear what you think so please leave a review.